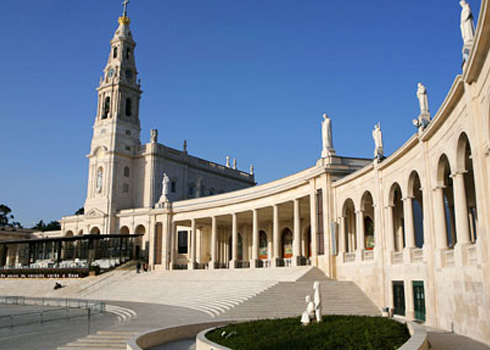 Traverse the holy grounds of the Sanctuary of Fatima, built on the site where Mary appeared to three shepherd children in the early twentieth century. Today, people from around the world come to the site to ask for miracles and give thanks for blessings. Every year, thousands of pilgrims flock to the Grotto where Mary appeared to St. Bernadette. Visit the Sanctuary of Our Lady of Lourdes and dip your hand—or immerse yourself—in the healing water. Within the enclosure of this charming sixteenth-century convent, see where St. Teresa of Avila lived, wrote, and heard the voice of God. Take the opportunity to walk in the peaceful interior courtyard and visit the museum dedicated to her. Your pilgrimage begins with an overnight flight(s) to Lisbon. Dinner and breakfast will be served on board. After arriving in Lisbon, you will join the other pilgrims for a tour of Lisbon. Stop at the historic St. Jerome's Monastery, visit the iconic Belem Tower, and celebrate Mass at St. Anthony's Church. After Mass, you will be transported to your hotel to check in and enjoy a welcome dinner. We will head to the old city of Santarem where we will attend Mass at the Church of St. Stephen, which holds a Eucharistic miracle. From there, we’ll journey on to Fatima to visit the village of Aljustrel, home to the three shepherd children who saw Our Lady of Fatima. After visiting the local parish, you will enjoy dinner at the hotel. Begin the day at the Little Chapel of the Apparitions, where Mary first appeared in 1917. Visit the Basilica of Our Lady of the Rosary and Holy Trinity Basilica, then pray the Stations of the Cross along the Via Sacra ("Sacred Way"). Our last stop is Valinhos, the site where Mary appeared in August 1917. End the day with prayer and a candlelight procession. After departing Fatima, we’ll head to Salamanca, a city known for its large university and prominent culture. Take a walking tour and see the grand Plaza Mayor, La Clerecia, La Casa de las Conchas, the University of Salamanca, the Roman Bridge, La Iglesia de San Marcos, and La Iglesia de San Martin. Return to your hotel for dinner. We’ll journey to Alba de Tormes and celebrate Mass at the Carmelite monastery that St. Teresa founded in 1571. 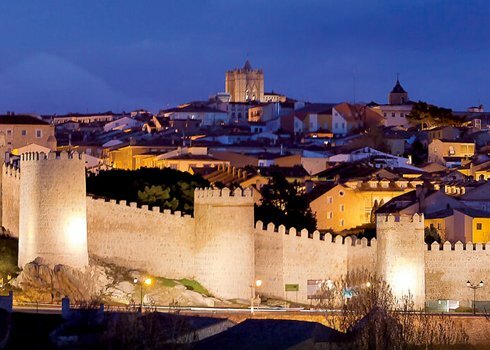 We will then head to the Spanish cities of Avila, walking in St. Teresa’s footsteps at the Incarnation Convent, and Burgos, the historic capital of Old Castile. Here, you’ll enjoy dinner and a free evening to explore the city. Following breakfast, we will head to Loyola to visit the birthplace of St. Ignatius, founder of the Jesuits. See the historic basilica dedicated to him, and pray in the room where he often prayed. Enjoy free time for lunch. After a bus trip through the stunning Pyrenees Mountains, we’ll arrive in Lourdes, check in to the hotel, and have dinner. 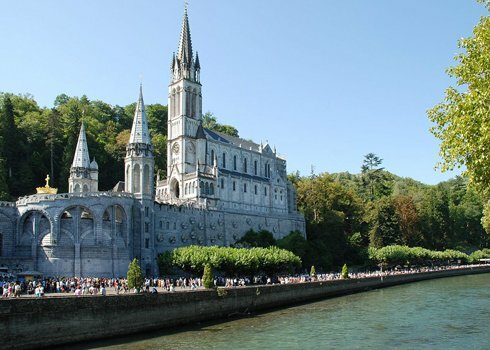 Over the course of two days in the vast Sanctuary of Our Lady of Lourdes, you’ll attend Mass at the Grotto of Massabielle where Mary appeared to St. Bernadette, watch a film on Lourdes, drink water from the miraculous spring, and submerge yourself in the healing baths. Meditate on the life-size Stations of the Cross overlooking the Grotto. See Boly Mill, St. Bernadette’s birthplace, and the Cachot (an abandoned prison where Bernadette's family lived). Participate in the Blessed Sacrament Procession to the Basilica of St. Pius X, the “Underground Basilica” (optional). End both days with dinner, praying the Rosary, and a candlelight procession. After breakfast, say “au revoir” as the bus transports you to the airport for your flight home. Sometimes we need to step back from life and take another look at who we are, what we are here for, what matters most, and what matters least. Without the distractions of your everyday life, Fatima and Lourdes provide the perfect opportunity to hear the voice of God and get to know Jesus in a whole new way. A pilgrimage is a wonderful opportunity to expand our knowledge of the world and experience our faith in breathtaking ways. Journey to some of the most sacred places in Portugal, France, and Spain, from the home of St. Teresa of Avila to the healing waters of Lourdes.